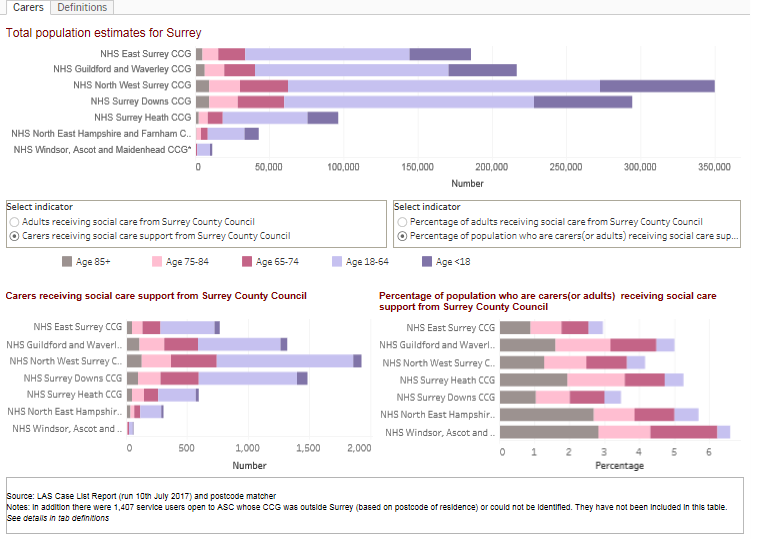 There are three main sources of information on the number of people living in Surrey Heath CCG area – resident, registered and housing constrained populations. The 2015 resident population of Surrey Heath CCG was estimated at 95,900 while the GP registered population was 94,074. In 2017, the GP registered population rose to 96,345 (May 2017). Taking into account housing availability, it is estimated the resident population will increase to 103,700 by 2027. The majority of the population of Surrey Heath is of working age. This has implications for the flexibility of delivery of health and social care around working patterns and for employers’ (including the NHS) responsibility to safeguard and improve the health of employees. There are significant numbers of children and young people and whilst the number of people aged over 65 is relatively small, both of these age-groups are more intensive users of health and social care than the working age population (who of course deliver most of these services). Population projections predict a small increase in the number of young children and those of working age. The population aged 65 and over is projected to go up from 18,500 in 2017 to 22,800 in 2027. There are significant predicted increases in those aged over 85 years with numbers predicted to increase by more than 40% in the next 10 years, compared to around 30% for Surrey as a whole. There were 1,107 live births in 2015. The birth rate in Surrey Heath (64 births /1,000 women aged 15-44 years) is similar to the Surrey average (63/1,000). A quarter of babies were born to mothers over 35 years of age. Risk and complications within pregnancy and birth increase with maternal age – as a consequence maternity services locally need to cater for a more complex population. They also need to consider the implications of the links between domestic abuse and pregnancy and the higher rate of births among traveller communities (with associated poorer maternal and infant health outcomes). Surrey in general is not as ethnically diverse as the rest of England. In Surrey Heath CCG, 9.3% of the population are from a non-white ethnic background. There are an estimated 128 Gypsy, Roma, and travellers residing in 32 pitches across six traveller sites in Surrey Heath. This group has significantly poorer health than any other disadvantaged UK residents. Around 3% of the population are likely to be Nepalese who have higher rates of diabetes and coronary heart disease than the general population. This population tends to live around the Frimley area. The estimated proportion of people with a learning disability in Surrey Heath in 2017 is 2.4% (1,865).of the population projected to increase by 2.8% to 1,917 over the next 5 years (2022). This has implications for accessibility of services and their capacity to make reasonable adjustments for these patients. This group are also more likely to suffer from a long term condition such as epilepsy, cardiovascular disease, hypertension and dementia. The uptake of the Annual Health Check for people with Learning Disability within primary care is a key programme for early identification of such problems. It is estimated that there are around 8,500 people providing unpaid care in Surrey heath, with around 1,500 providing more than 50 hours per week. Carers save health and social care services considerable amounts of resources but it is important they are considered in the care packages being offered to the person they are caring for as well as consideration being given to their own requirements for health and social care. There is a need to significantly increase the availability of information and advice for carers and take into account new rights for carers in the Care Act 2014 and the Children and Families Act 2014. People living in deprived communities engage in more risky health behaviours and are more likely to experience long term conditions at an earlier age, with consequent impact for the individuals and the health service. Particular focus is required on identifying needs in these areas and improving awareness of, and access to healthcare services. 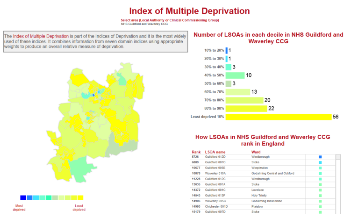 The index of multiple deprivation (IMD) is an overall measure of multiple deprivation experienced by people living in an area and is calculated for every Lower layer Super Output Area (LSOA), or neighbourhood, in England. Two of the small areas (LSOAs) in Old Dean and St Michaels in Surrey Heath are in the most deprived 30% of all small areas in England. There are further small areas in the Ash and Watchetts wards that fall into the most 40% deprived areas in the country. There are several areas of the Surrey Heath where people are deemed to have poor access to health services (particularly in the north and the south). This lack of access is particularly relevant in the rural areas. When commissioning services it might be necessary to consider how services are adapted to improve access for those who need them most. Access to the GP or hospital for households without a car can be problematic. Access to a GP within a reasonable time by public transport or walking can be as low as 42.1% amongst households without a car in Surrey and as low as 9.5% for hospital access. Information on Social Isolation was presented in the 2015 profile. The areas with the highest estimated likelihood of people who are socially isolated include Ash South and Tongham, Bagshot, Mytchett and Deepcut, Old Dean, St Michaels and Watchetts. Initiatives already in place to combat loneliness including care connectors, community transport, handy man services and dementia befriending. Commissioning plans should continue to look to make use of these services through referrals and sign posting to support patients who might present with social isolation or loneliness. The development of ‘social prescribing models’ is particularly relevant in relation to reducing social isolation. Residents of Surrey Heath can expect similar life expectancy compared to their counterparts in the rest of Surrey. LE is 81 years for men and 84.3 for women compared to 81.3 and 84.5 for men and women in Surrey respectively (2010-2012). On average, women in Surrey Heath can expect to live 3.3 years more than men. At the age of 65 years, men and women in Surrey Heath can expect to live for a further 19.5 years and 21.4 years respectively. Male life expectancy at age 65 is higher than the England average (18.6) while LE at age 65 for women is similar to the rest of Surrey. There is a considerable variation in both male and female life expectancy in different parts of Surrey Heath. There is a difference of 9.2 years in LE at birth for men born in Windlesham (85 years) compared to those born in St. Pauls (75.8 years). There is a bigger difference in life expectancy for women compared to men. Women born in Mytchett and Deepcut (89.4 years) can expect to live more than a full decade compared to those born in Old Dean (80.2 years). Healthy life expectancy (HLE) is an estimate of the number of years individuals can expect to live in good or very good health, based on a subjective assessment of health. By subtracting healthy life expectancy from overall life expectancy, the number of years people can expect to live in poor health out of their remaining years can be estimated. Men and women in Surrey Heath live 85% and 83% of their lives in ‘good health’ respectively. Men could therefore expect to live 12.2 years of their lives ‘not in good health’. Although women (84.3 years) live slightly longer than men (80.6 years), they spend an average of 14.3 years ‘not in good health’ which is 2.1 years more than men. Death rates are one way to measure the health of the local population. Information on the number of deaths in a year is also necessary to plan for end of life services, including requirements for palliative care. Potential years of life lost (PYLL) is a summary measure of premature deaths, i.e. those under the age of 75, due to causes of death which have been identified as amenable to prevention or delay through provision of good healthcare. All CCGs in surrey have a PYLL for all conditions that is significantly lower than that of England. There are no significant differences in PYLL between Surrey Heath and the other Surrey CCGs. Whilst PYLL for various conditions in Surrey Heath is low compared to England, a third of all years lost are due to heart disease and another third due to cancer. Programmes such as improved detection and management of hypertension, promoting increased awareness of signs and symptoms of cancer, and increasing cancer screening uptake is likely to reduce PYLL. Adult social care is the provision of support and personal care (as opposed to treatment) to meet needs arising from illness, disability or old age. The majority of people who receive state-funded long-term social care are aged 65 or over and the growth of the older population will pose a significant challenge in meeting the needs and demands on social care in the future. In Surrey Heath CCG there are more than 1,800 service users with an open case. Around 20.8% (531) of people aged 85 and over are service users with an open case. There are 600 carers with an open case in Surrey Heath CCG. It is known that poor diet, smoking tobacco, being overweight, alcohol misuse and physical activity are amongst the leading causes of premature mortality and long term conditions. Evidence suggests that adoption of the Make Every Contact Count approach across health and care could potentially have a significant impact on the health of the population. This approach encourage front line staff to use the opportunities arising during their routine interactions with patients to have brief conversations on how they might make positive improvements to their health or wellbeing. Also important is encouraging people to recognise their role in protecting their own health and managing existing conditions. Commissioners need to understand what support people need for good self-care, including utilising digital approaches. Smoking is a leading cause of preventable ill-health and death in the UK. In 2014, almost 80,000 deaths were attributable to smoking in England (ONS, 2017), as well as adding significantly to the burden on the NHS treating smoking-related illness. The government has set an ambitious smoking prevalence target for England of 12% by 2022. The rate of hospital admission episodes for alcohol related conditions (“broad” definition which means either the primary or secondary reason for admission relates to alcohol) in Surrey Heath CCG is 2,043 per 100,000 population which is less than the rate for England but higher than the rate for Surrey overall. (2014/15). The previously rising levels of admission rates appear to have levelled out. Alcohol related mortality is 31.4 per 100,000 population which is lower than the rate for England at 41.3 per 100,000. The alcohol related mortality for males is higher than for females (2014). The proportion of the population who, when surveyed, reported that they had eaten the recommended 5 portions of fruit and vegetables on the previous day in Surrey Heath (54%) is higher than for England (52%). (2015). Almost two thirds (65%) of adults in Surrey Heath Borough are classified as having excess weight, similar to the rest of England (2012-14). Around 18.7 % (560) of children in reception year and 27.4 % (714) of children in year 6 in Surrey Heath are classified as overweight or obese. These percentages are lower compared with England (22.2% for reception and 33.4% for year 6) but similar to those for Surrey overall (2012/13-2014/15). The proportion of five year old children free from dental decay in Surrey Heath CCG is 85.2 % which is better compared with England at 75.2 % (2014/15). Cardiovascular disease, cancer and respiratory disease are the top three contributing conditions to the life expectancy gap between the most and least deprived populations within Surrey. Long term conditions and their effective management is widely recognised to be one of the greatest challenges facing the NHS and Social Care. Long term conditions can affect many parts of a person’s life, from their ability to work and have relationships to housing and education opportunities. 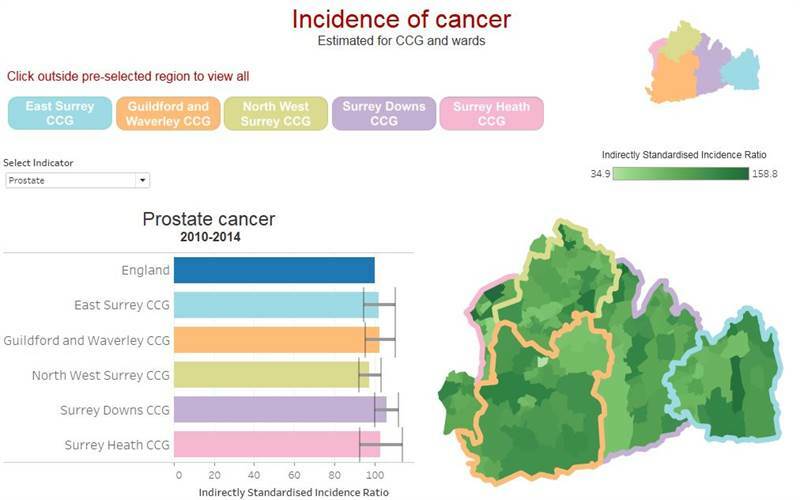 Surrey Heath CCG has a standardised incidence rate for all cancers of 96.6 which is similar to the national rate. The incidence rate for lung cancer in Surrey Heath is significantly lower than the national rate. 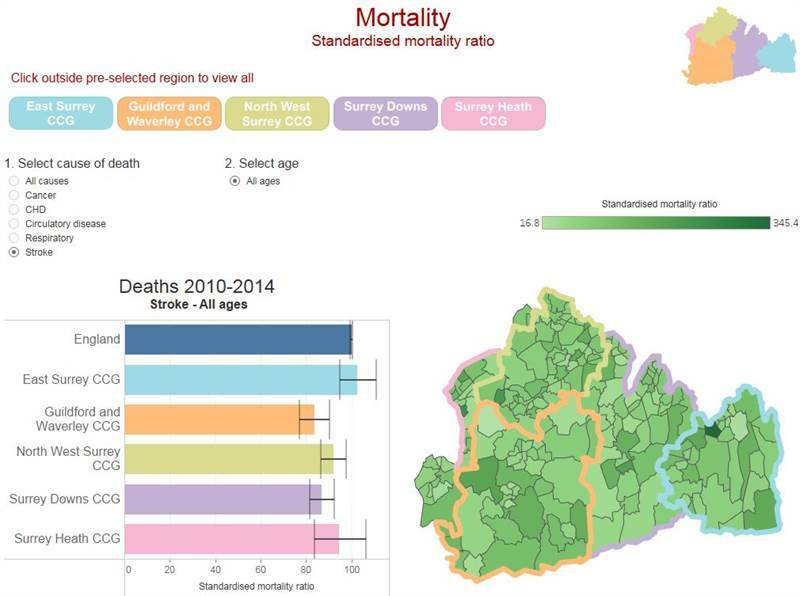 The standardised mortality ratio (see Mortality dashboard) for deaths caused by cancer in those aged less than 75 is lower in Surrey Heath CCG compared to England as a whole (77 versus 100) although the ratio for St Michaels ward is 137. In Surrey Heath CCG the standardised hospital emergency admission ratios (see hospital admissions dashboard) for stroke, Coronary Heart Disease (CHD), and myocardial infarction are all significantly lower than national rates. However, when compared to other Surrey CCGs, Surrey Heath has a significantly higher ratio of emergency admissions for CHD (93.2). The standardised mortality ratio for deaths caused by circulatory disease in those aged under 75 is lower in Surrey Heath CCG (78) compared to England). The ward of Old Dean has the highest mortality ratio in Surrey (152.3). 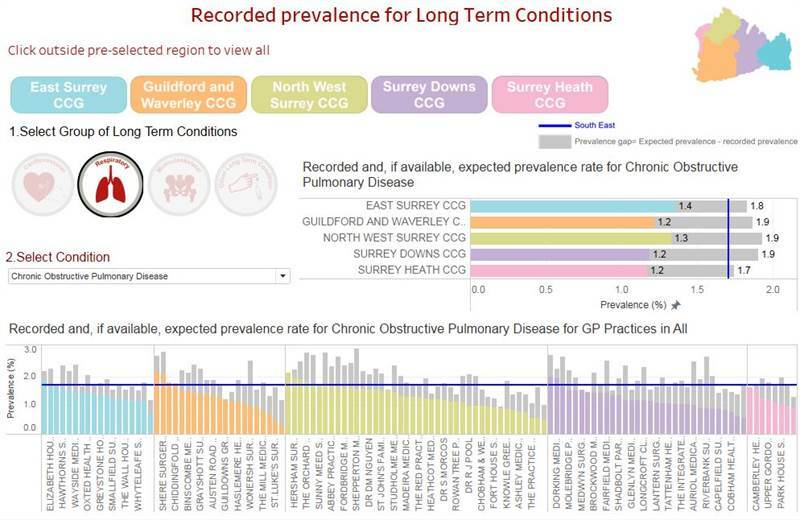 In Surrey Heath CCG, the standardised hospital emergency admission ratios for chronic obstructive pulmonary disease (COPD) is significantly lower than national rates. 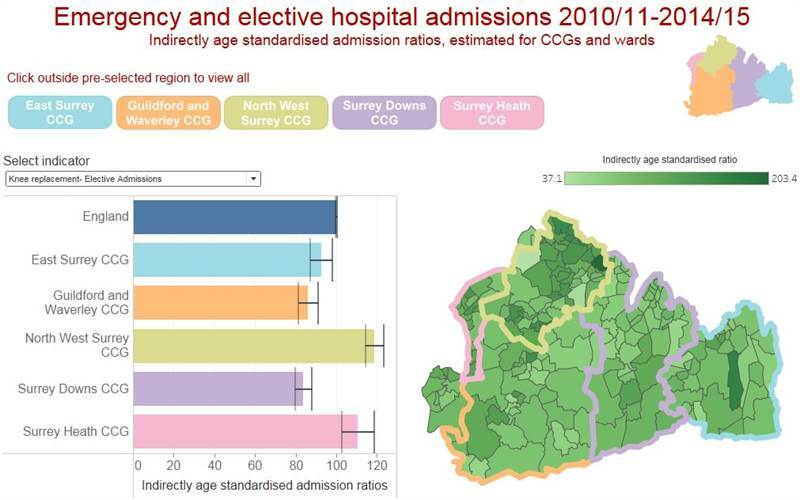 However, Surrey Heath has the highest ratio of emergency admissions for COPD (73.4) compared to all other Surrey CCGs. The standardised mortality ratio for respiratory disease is lower in Surrey Heath CCG compared to England as a whole (91). The ward of Old Dean has a respiratory disease mortality ratio of 195. Surrey Heath has the highest ratio of elective hip replacement admissions (119.2) out of all other CCGs in Surrey and this is significantly higher than England. The ratio of knee replacement admissions (110.4) is significantly higher than for England. Surrey Heath has an emergency admission ratio for hip fracture of 108.6, higher than all other Surrey CCGs and England (but not significantly different). GP recorded prevalence is generally the number of people on a GP practice’s disease register as a proportion of the number on the GP practice list. Evidence suggests that a significant proportion of prevalent disease remains undiagnosed. The diagnosis gap gives an indication of how many people in the local population are undiagnosed but may have that condition and so indicates the potential to find and treat people at an earlier stage of the disease. A diagnosis gap (proportion undiagnosed) exists for a number of cardiovascular conditions. The proportion of undiagnosed people is 35% for atrial fibrillation, 55% for heart failure, and 49% for hypertension. Diagnosis gaps also exist for Chronic Kidney disease (45%), Chronic Obstructive Pulmonary Disease (29%), and Diabetes Mellitus for people aged 17 or older (28%). Individual GP practices vary substantially in the level of diagnosis gap for different conditions. Dementia prevalence in Surrey Heath for all ages and those aged 65 years and over is 0.8% and 4.5% respectively. Currently 801 residents in Surrey Heath have been diagnosed with dementia (a diagnosis rate for Surrey Heath CCG is 68.2%, versus the national target of 67.9%). Reducing the dementia diagnosis prevalence gap was a local indicator for the Better Care Fund. Estimates of expected levels of dementia in the population indicate that 30% of the residents with dementia remain undiagnosed compared to the National average of 32.1%. A large proportion of older people occupying acute hospital beds are likely to suffer from dementia and they are more likely to have longer stays in hospital. Services should look to work with the variety of dementia support services across Surrey (i.e. dementia navigators) to improve access to services and suitable use of services for those with dementia and their carers. The IMD 2015 common mental illness score for England ranges from 3.09 to -2.85. The Surrey Heath CCG range is from 0.51 to -1.61. Overall common mental health needs in Surrey Heath CCG are relatively low compared to England. The ward with the highest level of common mental illness is Old Dean (0.51) and the ward with the lowest level is St Pauls (-1.04). The IMD data correlates well with estimated prevalence of common mental health disorders in that the prevalence estimate for Surrey Heath is 13%, which is lower than the England estimate of 15.6%. The future cost implications of depression can be reduced by greater focus on whole-population mental health promotion, mental disorder prevention and early treatment. In general there has been a downward trend in suicides in the UK and in Surrey since 2000. Surrey has historically had a lower rate of suicide compared to England. 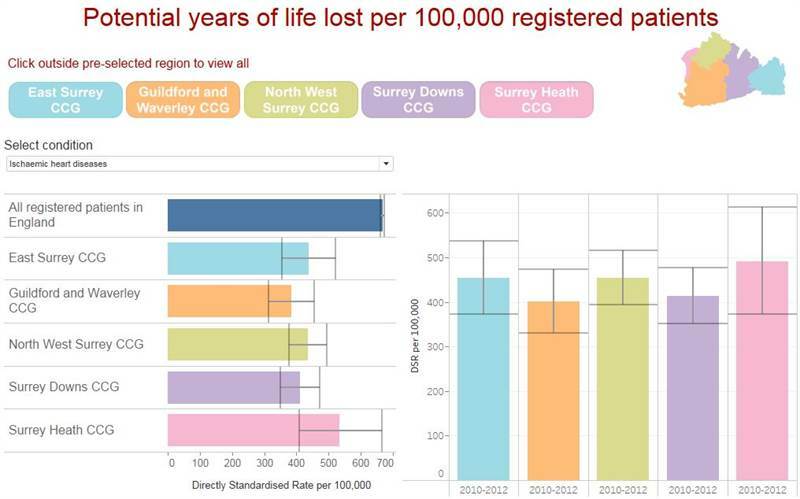 The mortality rate from suicide and undetermined injury in Surrey Heath CCG (9.9 per 100,000) is similar to the Surrey (9.1) and England average (10.1). Suicide rates in males are also similar to Surrey and National averages. Numbers of suicides among females were too small for a rate to be accurately calculated. Commissioners should continue to participate fully in the development and implementation of a multi-agency suicide prevention strategy for Surrey. The estimated prevalence of mental health disorders for the GP registered population aged 5 to 16 years in SHCCG (7.8%) is lower than for England (9.2%). The directly standardised hospital admission rate per 100,000 population for self-harm in children and young adults aged 10-24 years in Surrey Heath (449.1), although the second highest rate among the Surrey CCGs, this is not significantly higher than the National average (430.5). Due to insufficient data, national prevalence estimates have been applied to the Surrey Heath CCG population to arrive at the estimated numbers of mothers likely to suffer with mental health problems. This number is estimated to be between 150 to 295 women. The current Perinatal Mental Health JSNA chapter contains a range of recommendations for improving this care pathway. The rate of contact with specialist mental health services in Surrey Heath CCG was 2619.5 per 100,000 aged 18+. This is significantly higher than the England average of 2441.3. The discharge rate in SHCCG is significantly lower than England at 40.5 and 69.8 per 100,000 population (18+) respectively. The demand for mental health advice through NHS 111 made by those aged 65 years and over was significantly higher in Surrey Heath CCG (31.8%) compared to the National average (23.5%). Improving Access to Psychological Therapies (IAPT) services are provided to people with mild to moderate mental health problems. The main aims are to provide earlier and appropriate interventions and fewer episodes requiring secondary care and help people to have less time off work and retain and or return to employment. For Surrey Heath patients, the referral rate to IAPT (2016/17 Q3) was 583.3 per 100.000 population (crude rate) which is significantly lower than the England average (786.3). It is estimated that about 11.4% of those thought to have anxiety and depression accessed IAPT services. This is not significantly different from the national average of 17.2%. Mortality attributable to particulate air pollution in Surrey Heath is similar to that for England and Surrey overall. Around 4.6% of all deaths in Surrey Heath among people over 30 years of age are due to human-made air pollution. 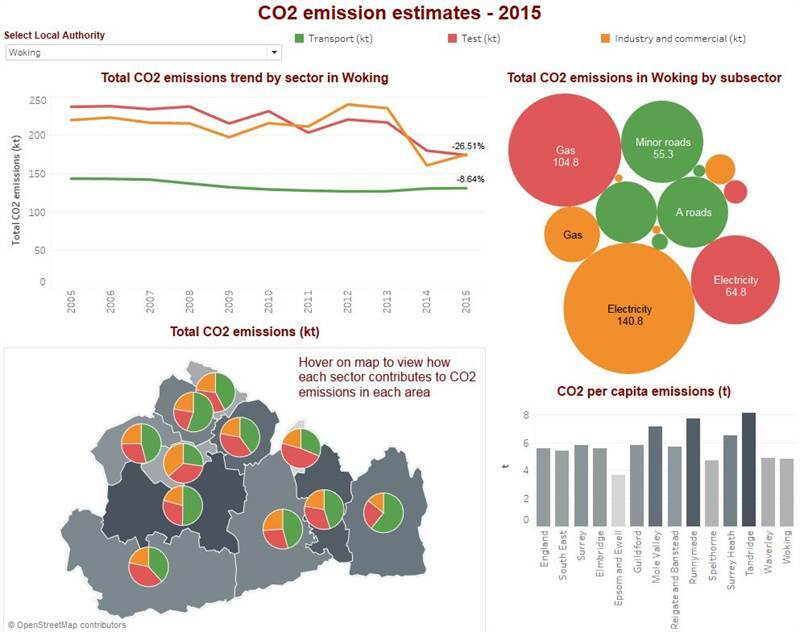 Partners across Surrey Heath could begin to work to lower air pollution and its effects through development of sustainability strategy and evidence based projects such as air alerts and travel initiatives such as increasing active travel and car-pooling. This executive summary provides a synopsis of some of the key indicators of relevance to commissioners, clinicians and care providers for the Surrey Heath CCG area. In summary, Surrey Heath overall is an affluent area, with good health outcomes and relatively low rates of many conditions and unhealthy behaviours; however, this masks some inequalities within the area, with some groups/smaller areas having significantly greater needs or worse outcomes. The data highlight key areas for consideration, including health inequalities, the growing population of those aged over 65, access to services for those without a car, a higher rate of hospital activity for hip and knee procedures, and significant proportions of people estimated to have long term conditions who remain undiagnosed.